Shin guards are one of those pieces of equipment that nobody wants to wear, but the benefits of them in the game of soccer are so vast that they have long since been made mandatory in organized play. A proper shin guard can mean the difference between a shattered leg and being able to walk off the field with no injury. The biggest issue with shin guards is their lack of comfort, but researchers have been working diligently for years to improve these pieces of equipment without sacrificing the quality of protection offered by them. The recent explosion in modern sports equipment has brought with it a wide selection of available shin guards, many of which claim to have solved the comfort issue. Different materials, construction designs, and sleeves have been developed to combat the problems seen in older, outdated shin guards. Comparing the many options is one of the best ways to ensure you find exactly the product you need. Some shin guards are made with removable sleeves for quick access, and others simply slide right into a knee sock and are held in place by their shape. Many are made with carbon fiber, but harder plastics and additional padding are included in others. Some shin guards are nothing more than a layer of gel cushion, but they all serve the same function. We’ve gathered a listing below of some of the most versatile adult shin guards and the best youth shin guards available on the market today. 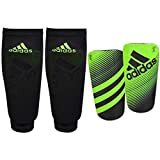 adidas Performance Ghost Guard – These high performance shin guards are made from dense polypropylene that has been molded to perfectly contour the shin. The Ghost Guards are a prime example of a slip-in shin guard, as these easily slide into the included compression sleeve for quick adjustments and a sure fit. The interior lining of these guards is a synthetic fiber that is designed to absorb shocks and provide further support and comfort. The ergonomic shape promotes circulation, and the hard shell guards prevent bruises, breaks, and other injuries. The Ghost Guards come in variety of colors, including Solar Green, Night Flash Purple, and Iron Metallic. Vizari Malaga Shin Guard – This traditional style shin guard comes in a variety of sizing options that make it perfect for use by youths and adults alike. The single piece design utilizes polypropylene plastic on the outer shell, and the interior of that hard shell is a soft padding for additional comfort. The back of the guard contains several thin compression straps that help hold it in place, and a heel strap provides a sure fit that won’t ride up or down. The Vizari Malaga comes in several distinct color options, including red, pink, sky blue, and black. These make a great starter pair, or they could be perfect for the seasoned athlete looking for a practice pair. Nike Mercurial Lite – These durable shin guards are made from K-resin and ethylene-vinyl acetate for the strongest construction possible while maintaining a lightweight design. The guards slip right into the included compression sleeve for stable performance and a tight fit. The shell is thin, yet strong, providing a low profile that doesn’t inhibit movement or gameplay. No straps are necessary with the Mercurial Lite guards thanks to the contoured sleeve. A carrying case is included to protect the guards when not in use, and they come in several awesome colors like Volt, Hyper Punch, and Turquoise. 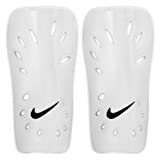 Champion Sports Youth Sock Style Soccer Shin Guards – Your child will never need to worry about bruised shins when they use the Champion Sports shin guards. These all in one guards include a knee sock sleeve design that allows the EVA foam shell to be easily inserted. Once the guards are in place, no other straps or ties are required. An ankle protector built in to the sock helps add stability, and the socks are fully machine washable. These simple sock style guards come in either black or white, and their affordability makes them ideal for children just starting in the sport. NIKE J GUARD – The Nike J Guard is a slip-in style shin guard that is suited for smaller players or youths. The exterior of the guards is a hard shell polypropylene plastic design, and the interior provides comfort and support with foam padding. The outer shell has a perforated construction for breathability, and the ergonomic shape is perfect for sliding into a knee sock. The J Guards come in a snow white color, and they have an intricate outer design that promotes a sure grip with any sleeve or sock. Shin guards have been evolving since they were first envisioned, and now the field is so saturated with products that it can be overwhelming when trying to find one suitable for you. It’s important to remember than each person is different, so what works for you may not work for someone else, and vice versa. While there are a few shin guards that go beyond the normal pricing range for such products, many are equally affordable. Price is usually an important factor when making any purchase, and obviously you want to find a pair of guards that won’t break your wallet, but many quality pairs can be bought for a reasonable price. Perhaps the most important factor to consider when searching for a new pair of shin guards is the size. Most hard shell shin guards are specifically designed to accommodate a single size, so it’s vital that you don’t waste money on a product before you’ve tried it for yourself. Once you’ve settled on a proper size and style, you should have no problem finding a pair of shin guards that meets each of your requirements.